Tim Moore, left, as Denny, and Craig Dolezel as Joey play Chicago police officers on a personal crusade against a criminal who harmed Denny and his family. Thingamajig Theatre Co.s production of Keith Huffs A Steady Rain is dark, grimy and suspenseful  an ambitious yet good selection for the winter season. As two Chicago police officers, and lifelong best friends, relentlessly search for a criminal, we watch the unwinding of their emotional fabric in this fast-paced two-man drama. 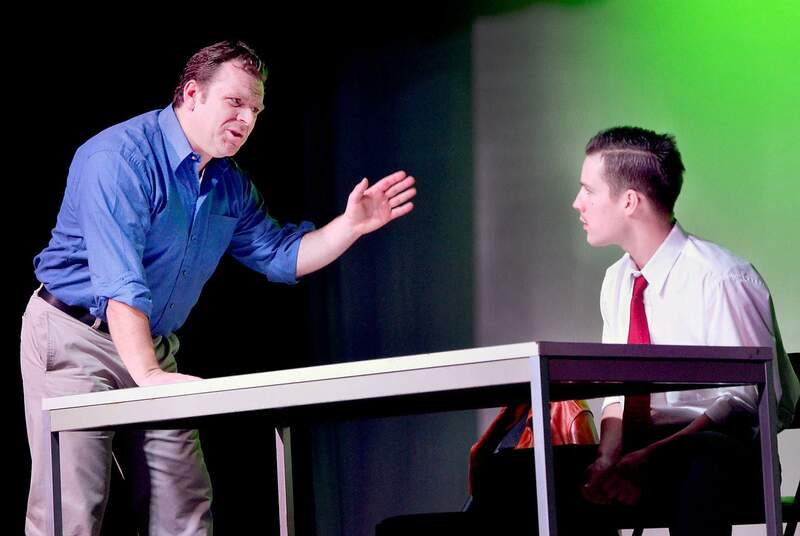 In the close setting of the Center for the Arts black box theater, Moore and Dolezel create an intimacy with the audience, pulling the viewer along on shootings, car chases and murder scenes as if they are in the patrol car as well. Denny and Joey narrate the story using an interrogation at a later date, re-enacting flashbacks until the final, unexpected climax. Moore and Dolezel are superb in their roles. Though Moore is a familiar face on the Pagosa stage, he quickly forces the audience to drop all association with his previous performances. Dolezel, visiting from the New York theater scene, brings a soulful intensity to the part of Joey. Moore said Thingamajigs winter season is about serving a local audience as opposed to the summer, which offers a lighter fare for tourists. With A Steady Rain, the Center for the Arts is certainly pushing the boundaries of theater in Southwest Colorado. The upcoming season at the Center for the Arts is a blend of light and heavy material, with Its a Wonderful Life next in queue for the holidays. Thingamajig Theatre Co. presents A Steady Rain By Keith Huff, directed by Pat Payne, at Pagosa Springs Center for the Arts, 2313 Eagle Drive. Show times are 7 p.m. Oct. 19, 20, 26 and 27 with matinees at 2 p.m. Oct. 21 and 28. Tickets cost $18 in advance/$25 at the door, available by phone at 731-7469 or online at www.pagosacenter.org. The play is R-rated and is recommended for mature audiences.